across the desert sands I flew. I saw tall metal skeletons. on long thin legs they seemed to march in giant steps. a symbol of our hard material age..
blood of the fire that was soon to flood your land. after swimming in the clear warm waters of the Arabian sea. a Fata Morgana of iron and steel. exploded and infernal fires raged across the desert sands. and choked all life within it. A paper doll was found floating in the fountain. as if weightless and let herself fall. back to the source of life - to die. 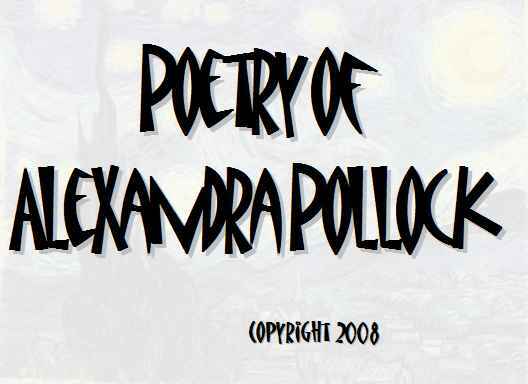 Copyright 2008, Alexandra Pollock. © This work is protected under the U.S. copyright laws. It may not be reproduced, reprinted, reused, or altered without the expressed written permission of the author. Originally from Austria, Alexandra Pollock lived in Australia for 15 years then came to Canada in 1963. In 1982 she graduated from Concordia University in Montreal with a BA in TESL and an MA in Special Programs in Education. I subsequently taught English in the adult education program both at McGill University and for the Montreal school board, as well as doing some part-time translation (German-English). In 1985 I took a teaching job at Kuwait University. Following the invasion of Kuwait in 1990 I returned to the Gulf and taught English at Bahrain University for the next 4 years.